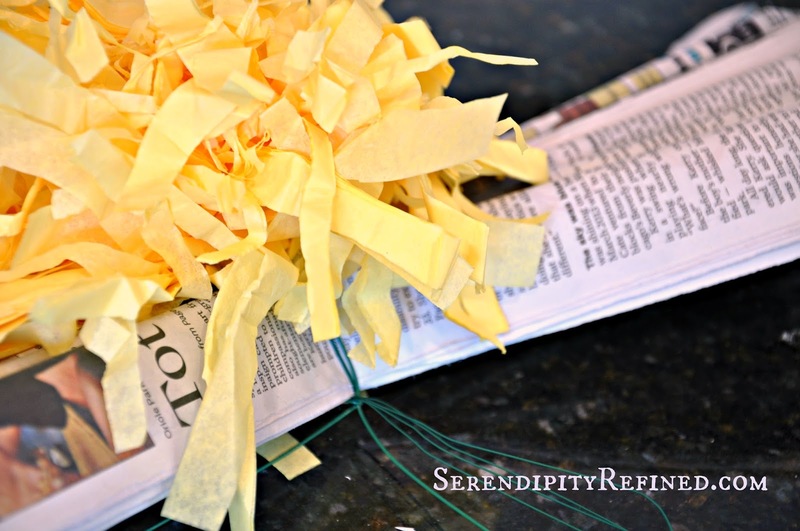 Serendipity Refined Blog: DIY Giant Free Standing Paper flowers on Pipe Stems. 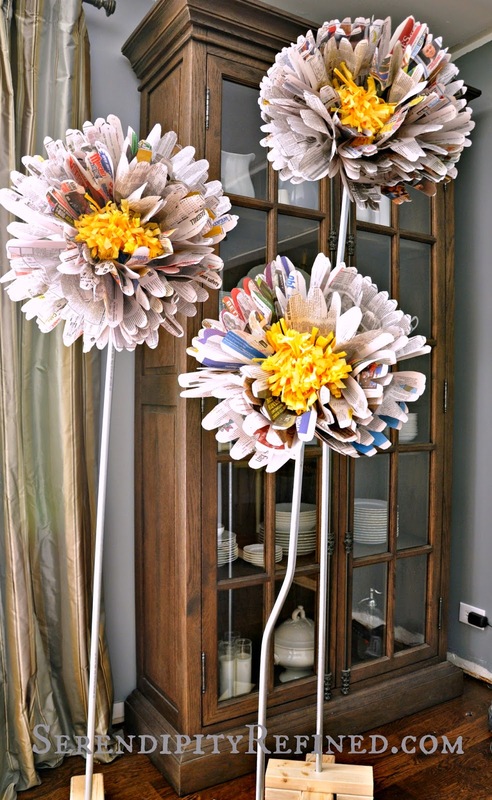 DIY Giant Free Standing Paper flowers on Pipe Stems. If you're looking for cheap and easy decor for a party or outdoor wedding or reception that will make a BIG statement...consider making some of these giant flowers! 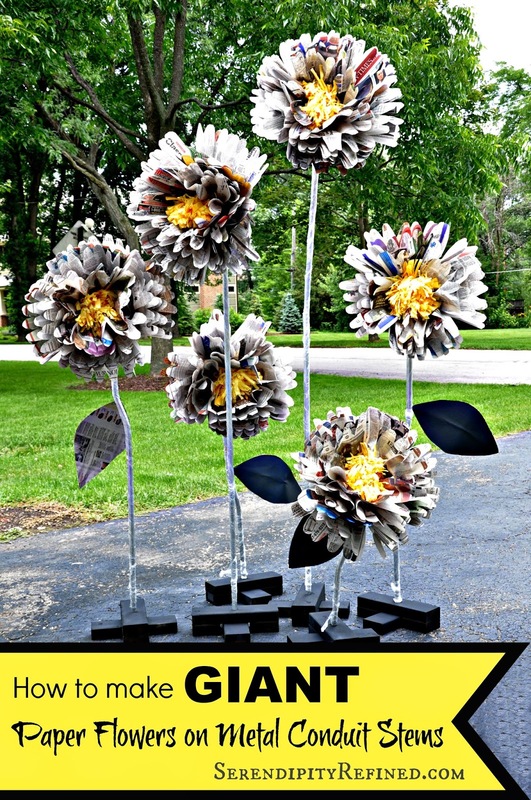 As promised when I shared the yellow black and white summer storefront window that I created at the shop last week, today I'm showing you how to DIY the giant free standing paper flowers on electric conduit pipe stems that I used in the display. The process for making the flowers is pretty simple. 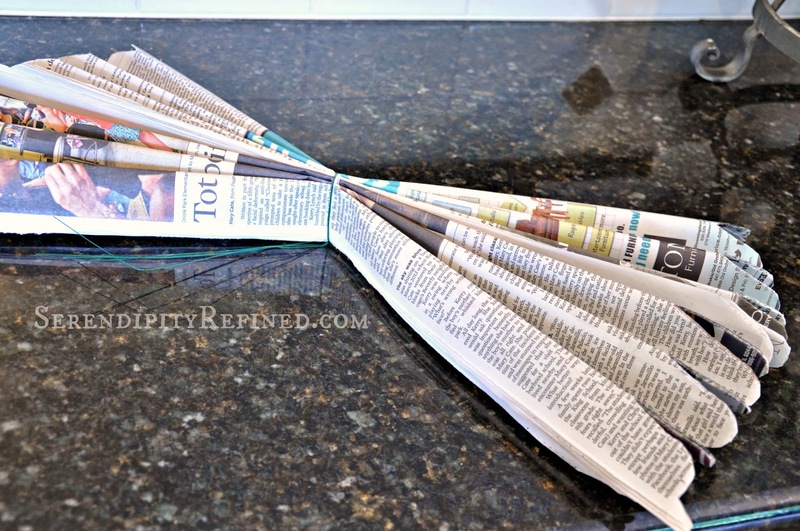 To make the "petals", make two stacks with 7 sheets of newspaper in each. Accordion fold the stacks of paper with each fold about 1 1/2 inches wide. After folding, place the stacks side by side and wrap two pieces of 12 inch long floral wire around the center, twisting once. Cut the ends so that they are rounded for about 2 inches. 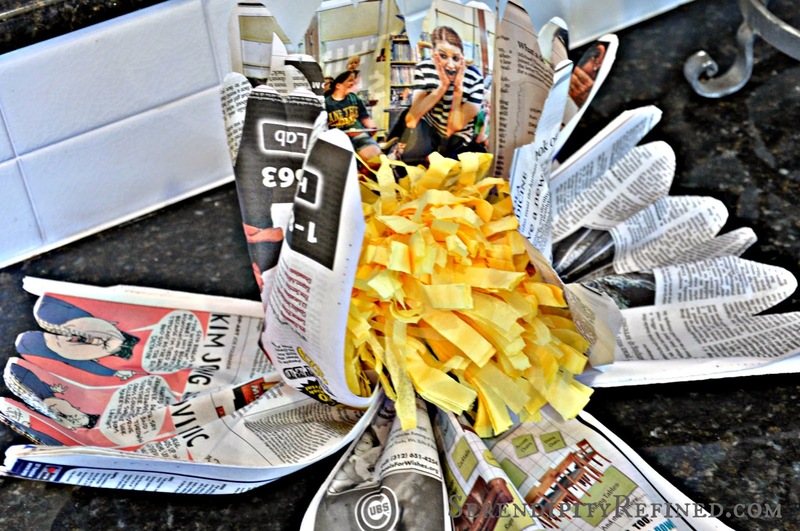 To make the centers, accordion fold 4 sheets of tissue paper and cut them in half (enough for two flower centers). Wrap a single piece of 12 inch floral wire around the center of the accordion then cut the ends into "strips" being careful not to cut all the way through the center (I left about an inch in the middle). 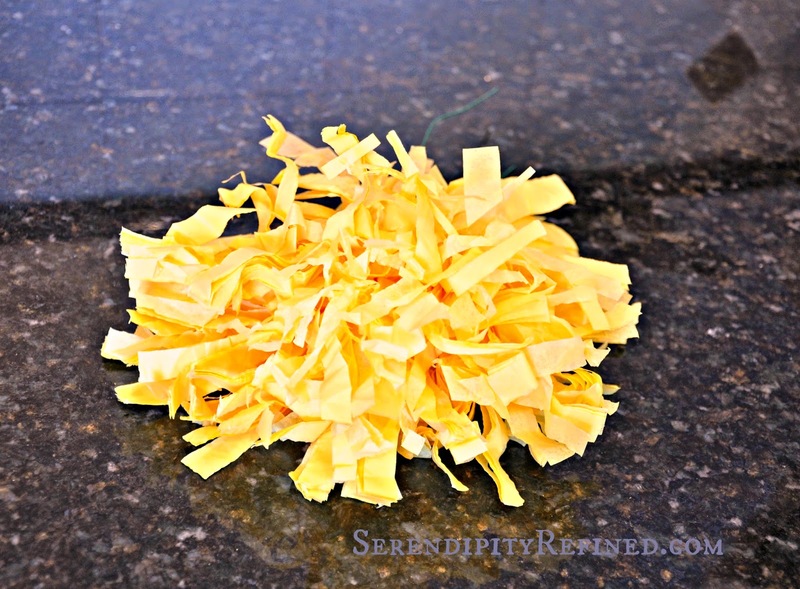 After cutting the strips, either separate or "scrunch" them with your fingers until they look messy and fluffy. 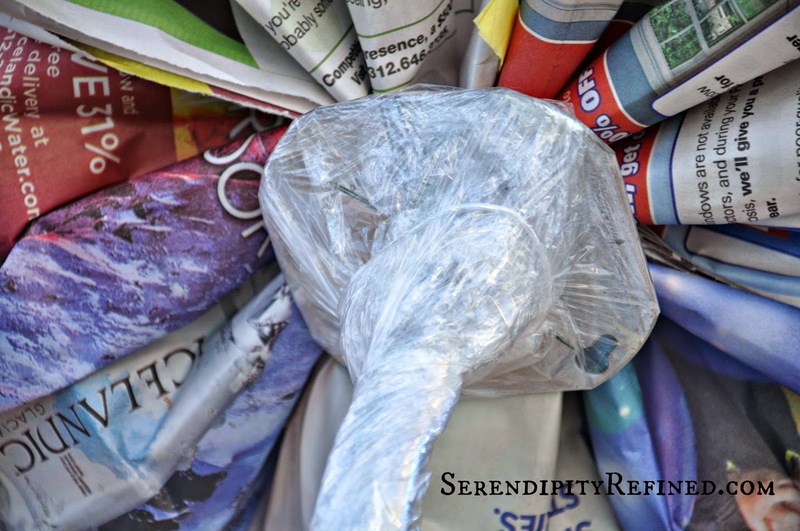 Add the tissue paper piece to the center of the folded flower petals by twisting the wire around the petals once. 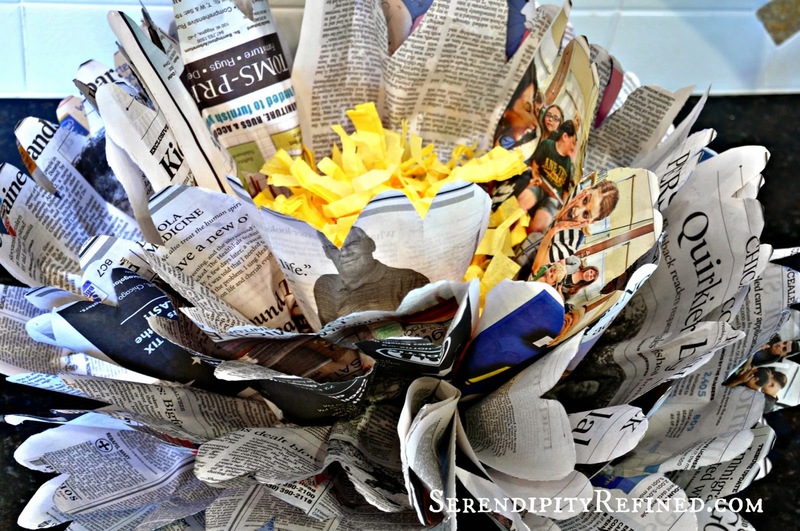 Carefully fan out the petals and begin to fluff them by pulling them toward the center, one piece at a time, working your way around the flower until all layers are separated. Adjust as needed. Next, form the stems by cutting electrical conduit pipe to different lengths (mine range in length from 3 feet to 6 feet). 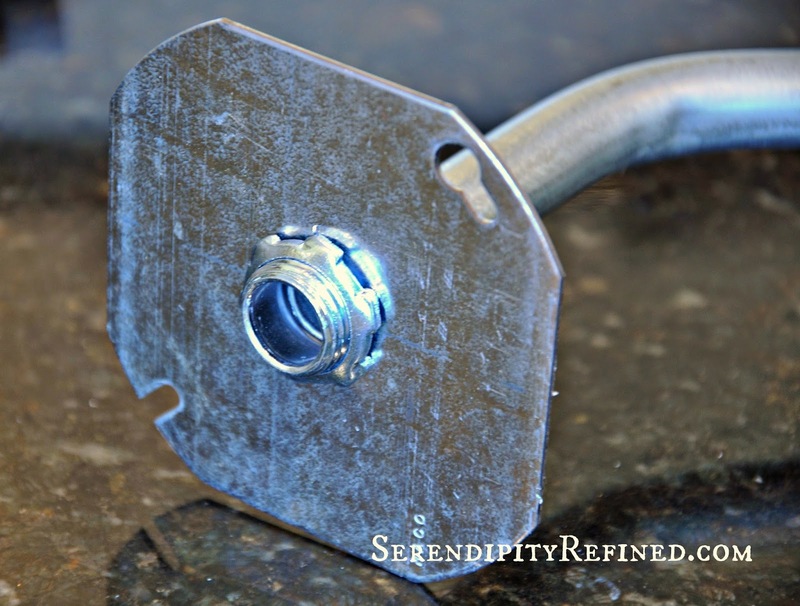 Bend the top of the pipe into a gentle arch using a conduit bender or by standing on the pipe and pulling gently on the end to bend it upwardworking your way slowly down about 1/4 the pipe. Add a bend in the center if you're adding leaves. 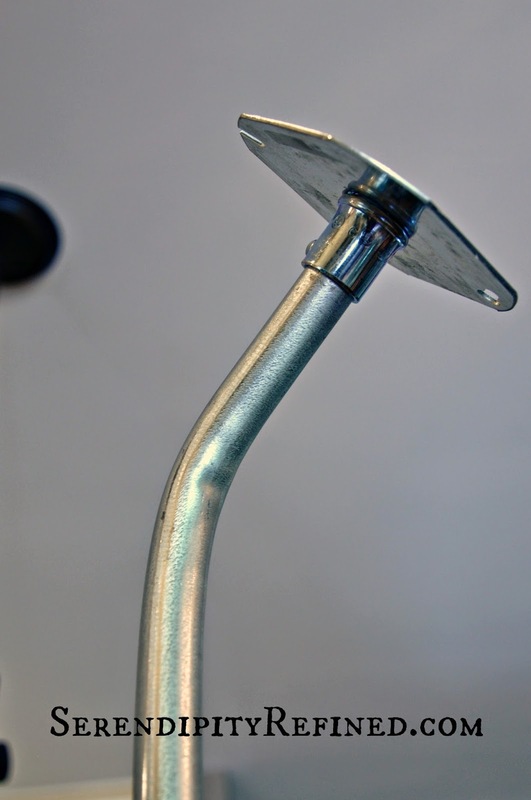 At the curved end of the stem, attach a 1 1/2 inch screw connector. To this, add 4 inch blank octagonal plate with the center punched out and attach it with a locknut. 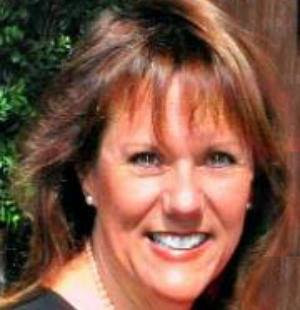 In the spirit of full disclosure, Kelly's husband, Patrick is an electrician. I explained what I wanted and he put these together for me but it IS an easy DIY. You can find all of the parts at your local home improvement center. Last, make a base out of 2x4 wood. 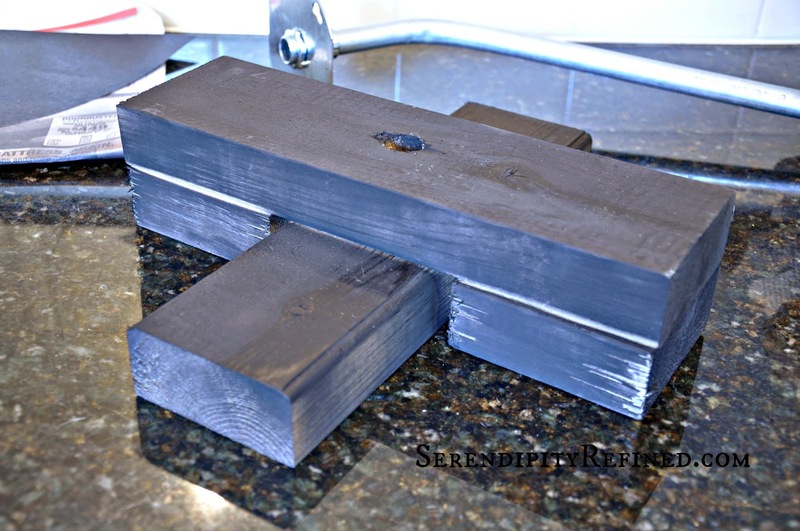 Cut two pieces that are 12 to 14 inches long. Form an X. add two 4 to 5 inch long blocks beneath the upper "arm" to stabilize. Glue or nail the base together. 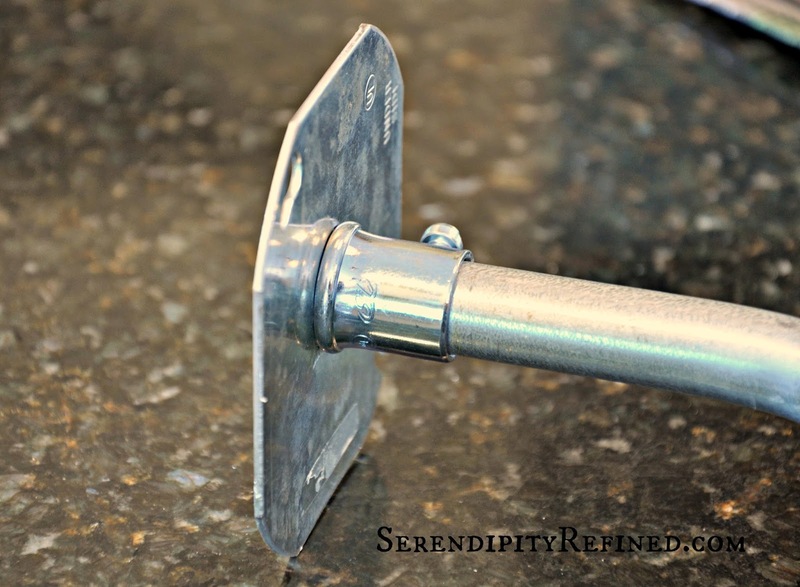 Drill a hole through the center to accept the conduit (I used 3/4"). Wire the paper flower to the plate and fasten securely. (You may also want to glue the flower to the plate, I am going to re-use the "stems" so mine are wired on). Place the flower in the base (add leaves if desired) and wrap the plate and the stem in plastic wrap. Tape the plastic wrap into place at the bottom where the stem meets the base. Stand a few in your living room...or driveway...or use them to decorate your shop...or party. 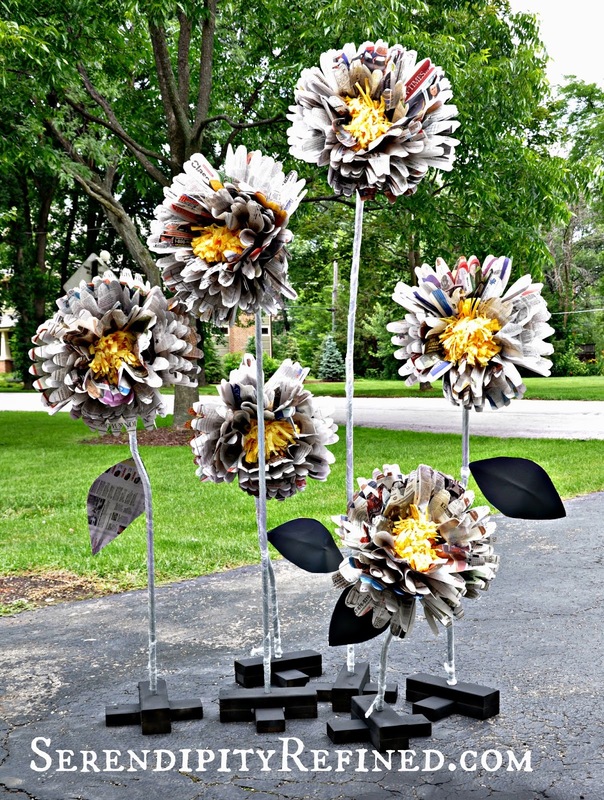 These giant paper flowers are an easy and inexpensive way to decorate for a party or wedding. 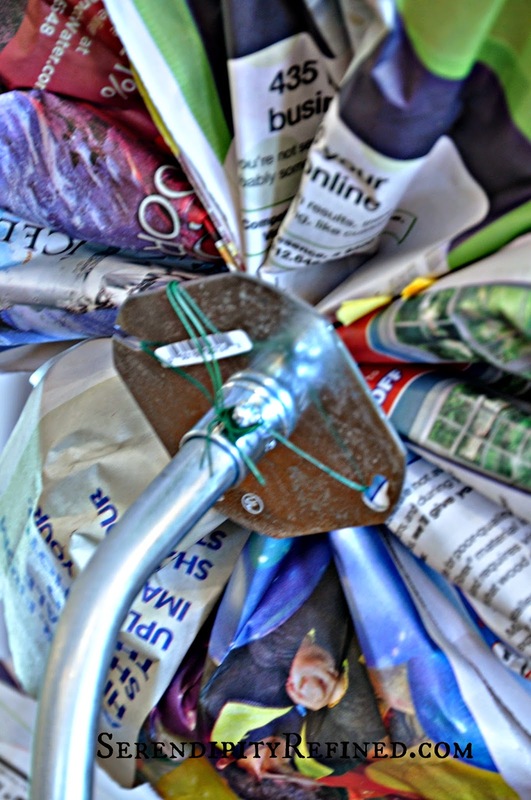 They can be made out of tissue paper, newsprint, fabric, or even plastic table cloths. You'll see these giant flowers again, I promise. I've already got plans to change them for fall...and maybe winter! Oh...and don't you think that they'd make fabulous giant daffodils in the spring! ?